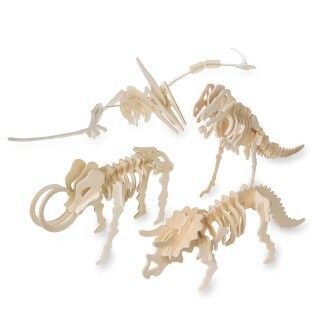 3 each of 4 dinosaurs. Pteranodon is 10-1/2"L with a 20" wingspan (21 pcs. ); Mammoth is 10"L x 6-1/2"H (19 pcs. ); Triceratops is 13"L x 4-1/2"H (17 pcs. ); and T-Rex is 13"L x 9"H (26 pcs.). Engaging models for our summer camp group of 3rd-5th graders. Most could assemble with limited adult assistance. We used a hot glue gun at all the joints to keep them together done by an adult after child assembly. Then they held up to gentle playing.My complaint is that only two are actually dinosaurs. Other two are a mammoth and a pterosaur. T-Rex is also in a rather old-fashioned stance.Would recommended as a camp or birthday party activity. Recommended to one parent whose child was interested in completing the set. Good project for boys or girls. Easy to assemble although the instructions are a little difficult -- just the images of the pieces and numbers. Good for older kids or with an adult. Looks nice when finished. A favorite at our program! EVERYONE loves these!!! Not only is this product educational... it is fun to do! Good product that has a good amount of challenge for the client and also gives them a feeling of accomplishment without being too hard to complete. A great project for my older students looks great when completed. It is difficult to assemble and requires extended time.